Ryan Coogler is directing the Black Panther film that will hit theaters February, 2018. In a recent interview at Comic-Con, Coogler said he loved this current run in the comics. He also hinted at possibly taking some elements of the story and adapting it to his movie. That’s what true geniuses do. The great creators are influenced by all sorts of different mediums and shouldn’t shape their creation solely off of their own, unique vision. In a way you should, but inspiration can be found anywhere. Anyway, Coogler talked about this current run’s writer Ta-Nehisi Coates. He said that he’s currently obsessed with Coates’ work. He also said Coates is currently his favorite writer. I have to agree. 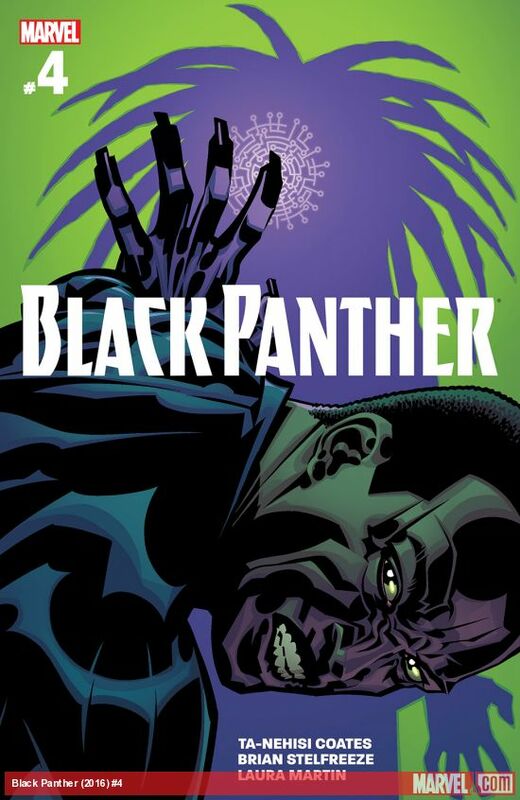 After reading this Black Panther run, I have been fascinated with Coates and his writing style. I am planning on buying his most recent book. His style is so unique. I’m extremely glad that Marvel chose him to write this series. Black Panther wasn’t known to a lot of fans, but now is one of the most popular characters in Marvel. Issue #4 continues to echo this idea of technology vs. tradition. I was expecting fireworks, and boy this issue didn’t disappoint. So, for those of you who haven’t even picked up an issue of this run yet, (shame on you) let’s get you caught up. King T’Challa is dealing with an uprising right now. His country does not feel safe anymore. Numerous invasions from Marvel figures such as Doctor Doom and Namor have left the great country broken. Who do people blame for this? Their King of course. In the first two issues, T’Challa is fighting rebels around his country and trying to keep the peace. The queen-mother at his side, Ramonda, has been the voice of reason for Black Panther when he starts to lose his mind. Aneka and Ayo are former members of T’Challa’s royal guard the Dora Milaje. They are disgraced soldiers but have come together to form the Midnight Angels. They go from city to city liberating women from camps and defeating war lords. Tetu and Zenzi are two individuals that have risen up against the king because of his “betrayal.” They both have mystical powers that have allowed them to fight against T’Challa. In the last issue, we got more insight into Tetu’s motivations. He is the leading revolutionary who believes Wakanda has lost its way. That technology forced tradition to take a back seat, just so the royal family could prosper. Like I said in my last review of the third issue, there really isn’t a villain in this story. I understand both points of view, and to this point, nothing serious has come of their revolution. That changes in this issue though. We start things off with T’Challa and his crew. He’s getting briefed on things happening in his country. He gets a report of the Midnight Angels and their actions, and also a connection between Tetu and an older professor. Changamire is the professor. Tetu sought his advice in an earlier issue. T’Challa learns that several other people have sided with his former Dora Milaje. They have done everything from raiding the city to writing and instituting new laws. The quote Hodari, the member of the council, says here is great, “My king, this is not mere hooliganism…this is revolution.” The dreaded word I’m sure the king didn’t want to hear. The art throughout this entire run has been great. T’Challa’s face as hears the word revolution is intense. Later, Ramonda, the queen mother, pays a visit to the old professor Changamire. He tells her he doesn’t know anything about the current revolution going on. The dialogue here is great because I got the sense of a long, forgotten relationship between the two. Ramonda has been one of those characters you don’t realize how great she is until the end. Her lines are written so beautifully. Her best line here was when she reminded Changamire why they couldn’t work. She says, “And then I remembered that my destiny was not to be a woman, but to be a queen.” Powerful. They end their conversation by talking about what Wakanda was supposed to be. Changamire says the country was supposed to be exceptional. Ramonda dismisses that. She says the country is exceptional, but Changamire condemned them because they weren’t divine. The issue then goes to Tetu and the Midnight Angles. The three have finally met. He tells a story once again of him connecting with the pureness of the land. He talks about how it gave him strength, strength no man has ever had. It is here where I started to sniff out Tetu’s dishonor. I agree with his points he made in the last issue, but his motivations seem a bit flawed. It seems as if he mainly wants to out-gun T’Challa, rather than show him a new government. The Midnight Angels aren’t the same way. They want to establish a new order that thrives better than Wakanda. Tetu just wants to tear the order down. Wrap them up in shiny paper, and they can look like the same thing. Where I noticed this is when Tetu talks about Storm. He pulls up a picture of her and asks the Midnight Angels if they have taken into account T’Challa’s allies beyond the border. The Midnight Angels respect his position but state that as of right now, all they have is a common enemy, and that is not enough to unite them fully. You can see here the difference in approaches for our two “villain” teams. The next part of the issue resonates with me the most. T’Challa is atop a balcony of some sort with Ramonda. He’s wearing a cool purple shirt and tan pants. It’s funny to see him dressed down like this, even though he is still wearing the suit underneath. Ramonda assures him that Changamire was not harboring any information about the revolution. She talks about first arriving to Wakanda. She talks about how Wakanda was deep into philosophy back then. They believed that their advanced society needed to develop an advanced morality. She then tells him that ridding Wakanda of these rebels won’t solve his ultimate problem…the people. She tells him that the first order of government is to protect its people. T’Challa reminds her that he has failed at that. She tells him that protection is not enough though. Force is not enough. She tells her king that he must give the people more. He is baffled at her response because he feels as if he’s given his people everything. She’s straight up with him, telling him that he’s always treated his people as a burden. He’s felt the weight of the crown, but never the glory of being a king. He asks her how can he give the people more. Her answer is simple. Inspiration. The panels show T’Challa in the streets connecting with the people of Wakanda. A child is standing there in awe of the fact a king is touching him. It’s beautiful. This is why this scene resonates with me. If you’ve read any of my other reviews, I think about real life when I read comics. I live a real life, and real life will swallow you alive if you ignore it completely. This election year is a big one in America. I don’t really care for either candidate, but Donald Trump’s rhetoric is dangerous. He pledges to protect America from the growing Islamic threat from around the world. He also pledges to protect Americans from the increasing number of immigrants that come into the United States via Mexico. Lastly, he pledges to protect Americans from the radicals who support the Black Lives Matter movement. Whether you agree or not with what he considers “problems,” isn’t what I’m getting at. The main word in his speeches is protection. Rarely does he elaborate on any plans when it comes to bringing our country together. Fixing schools, fixing the economy, establishing better trust between police and black neighborhoods, working well with Congress, creating jobs, etc. Some of these are tied to protection in some way. Some of them aren’t tied into protection at all. As Ramonda stated, protection and force is not enough. It only is one aspect of government. T’Challa has failed in providing his country with everything else as well as protection, so the unrest is understandable. I can’t help but think of America’s current state when reading this quote, because I feel something bubbling up in our country. I’m not sure if protection is what people want or need right now. The quote where Ramonda talks about their advanced society needing advanced morality hit me too. Technology has given us a platform to discuss a plethora of views. Without technology or the growth of the internet, I couldn’t rant about superheroes. But have our morals evolved with it? I like to think so, but when I see situations on Twitter or Facebook such as pure harassment shielded behind this idea of “free speech” I worry. Technology has molded our society into one with brilliant thinkers. Intellectuals who push the boundary of what’s real and fake. Technology has also fostered this attitude of complacency. This attitude of being better than someone just because we have a computer. It has blinded our view when it comes to a lot of different issues. Social media is the new media. People create trends just as much, if not more, as big corporations do. When I see the extreme level of apathy regarding real issues in our country on social media, I question if our morality needs to catch up to our society. I can’t answer what will happen if it doesn’t. Hell, I’m not even sure it’s lacking. But Black Panther #4 brings it up as a strong possibility. The issue ends with a reveal. A man named Zeke Stane is helping Tetu behind the scenes. He asks Tetu if he really wants a revolution, or is he just blowing smoke. He lets Tetu know that a revolution is more than poetic phrases and dances. As he’s talking, a bomb goes off where T’Challa and Ramonda are. His suit protects the two of them, but Ramonda is seriously injured. One of the best images from this run comes as T’Challa stands there with his royal clothing burnt off, while his suit shows. I believe it is symbolic of him completely moving on from this old Wakandan way. This is evident by his quote at the end. Hodari tells him the queen mother will recover. T’Challa tells his council, “All of you listen. No more discourse. No more deliberation. No more excuses. No more mercy. We know what this is. It is war. And war is our nation’s trade. It has been so for generations. We are Wakanda. We will not be terrorized. We are terror itself.” I got chills reading this. The issue ends with T’Challa putting on his full suit for the first time in the series. Up until this point, he was dealing with petty criminals and light situations. Now, the rebels have killed innocents in the name of their cause. Right or not, T’Challa won’t allow it because he is king. It’s an interesting situation because I believe this gives us an inside look at what any leader of a country goes through. Wakanda is different being they are a warrior nation ruled by a king, but the governing ideals remain the same everywhere. These decisions are hard to make and when someone forces your hand, you have to act. Is every reaction justified? I think you have to go to the root of the problem for that answer. Here though, T’Challa needs to instill order in his country. Overall, this is my favorite comic run in a long time. It is deep, thought provoking, and written really well. I encourage anyone reading this to get Coates’ other works whether it is fiction or non-fiction. The man has a powerful voice. I’m excited to see how Black Panther responds in the next arc. Wakanda shall rise again! Hope you enjoyed this review! Tomorrow I will be posting my Jessica Jones season 1 review. Like and share this post to other social media sites and follow me on Twitter @Hero_Review for more updates on my future reviews! Until next time everyone. Peace, Love, and Comics!! !